Apple-cinnamon flavored oral dewormer is safe and convenient for use in all horses, foals and ponies. 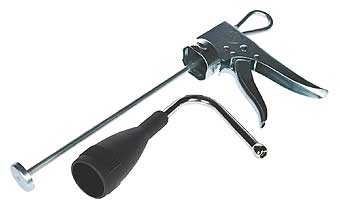 For the control of large strongyles, small strongyles, roundworms and pinworms. Contains 100mg. fenbendazole per gm. Each 25gm. syringe will treat one 1,100 pounds horse; each 92gm. syringe will treat 8 - 500 pounds animals. 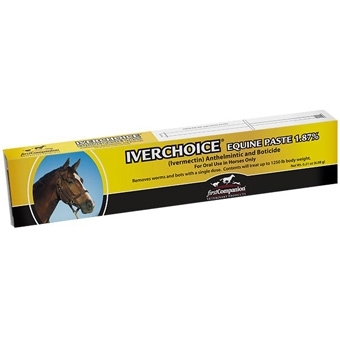 For foals and weanlings less than 18 months of age, use double the dose on a per pound basis. A horse wormer effective for removal and control of large roundworms, large strongyles, small strongyles and pinworms. One syringe treats a 1200lb horse. Horses over 8 months of age should repeat does every 6 weeks. 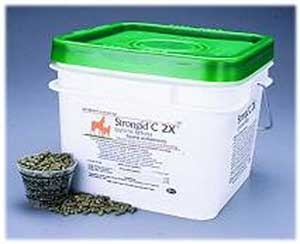 Safe for use in foals, pregnant mares, and breeding stallions. Quest is a clear gel that melts almost instantly in the horses mouth. No more spit-out paste or wasted medication. Quest is a single-dose clear gel formulation that is highly acceptable to horses and controls all stages of the most common and economically significant worms and bots, in just 4 treatments per year. Quest contains the active ingredient moxidectin, a new generation of anthelmintic which is in a different drug class than ivermectin-based products. Moxidetin is used worldwide for worm and bot control in horses and for worm, grub, lice and mite control in cattle. Quest has been proven to kill encysted cyathostomes while they are in the gut wall. This prevents encysted cyathostomes from emerging and creating the potential for intestinal damage and disease, including colic, diahhrea, bleeding and weight loss. Quest is the only product labeled to control encysted small strongyles. 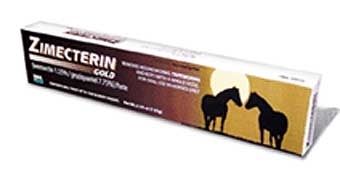 Zimecterin is a broad-spectrum dewormer that controls 35 stages and species of worms and bots protection that is unsurpassed by any other retail product available. It is safe for foals at any age and is made by Merial, the same company that makes Frontline and Heartguard for dogs and Ivomec for cattle. Zimecterin has no age restrictions, provides a wide margin of safety, and is highly effective for protecting foals during this critical time in their development. Many veterinarians recommend deworming foals every 30 to 60 days during their first year. 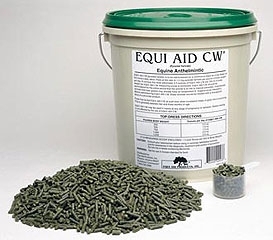 Equi Aid 2.11 percent Pyrantel Tartrate medicated pellets for daily feeding to prevent strongylus vulgaris larval infestation. Controls large and small strongyles, pinworms and ascarids. Give .5 oz. per 250 lb. body weight daily. Apple-cinnamon flavored oral dewormer is safe and convenient for use in all horses, foals and ponies. For the control of large strongyles, small strongyles, roundworms and pinworms. Contains 100 mg. fenbendazole per gm. Each 25 gm. syringe will treat one 1,100 pounds horse; each 92 gm. syringe will treat 8 - 500 pounds animals. For foals and weanlings less than 18 months of age, use double the dose on a per pound basis. Follow label directions. 2.11 Percent Pyrantel Tartrate medicated pellets for daily feeding to prevent strongylus vulgaris larval infestation. Controls large and small strongyles, pinworms and ascarids. Give .5 oz. Per 250 lb. body weight daily. A dewormer to be fed daily at the rate of 4 oz. per 1000 lb. Horse. 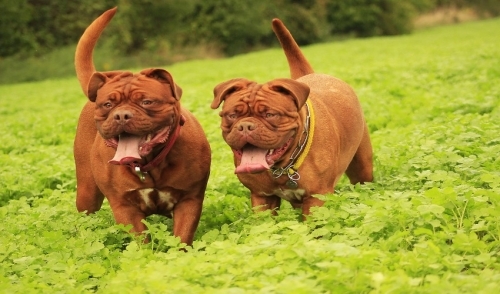 Provides control of large and small strongyles, large roundworms and pinworms. Effective broad-spectrum control paste kills important internal parasites, including bots and the arterials stages of Strongylus vulgaris, with a single dose. Safeguard Equibits is an alfalfa-based pellet that lets you feed and deworm in a single step. 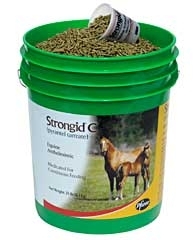 Armed with fenbendazole, the active ingredient in all Safe-Guard products, Equi-bits pellets control large strongyles, small strongyles, pinworms and ascarids. 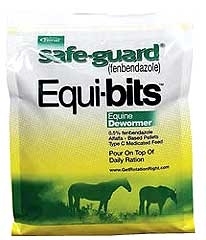 Safe-guard Equi-bits is safe for horses, including foals and pregnant mares. Equimax is the FDA approved all-in-one dewormer that combines Ivermectin and Praziquantel to safely and effectively rid horses of all major internal parasites, including tapeworms, in a single dose. Equimax is as effective as Ivermectin against tapeworms, anoplocephala perfoliata.